Do you like your noir with scantily clad femme fatales, scarred anti-heroes, razor-sharp one-liners and plenty of blood? 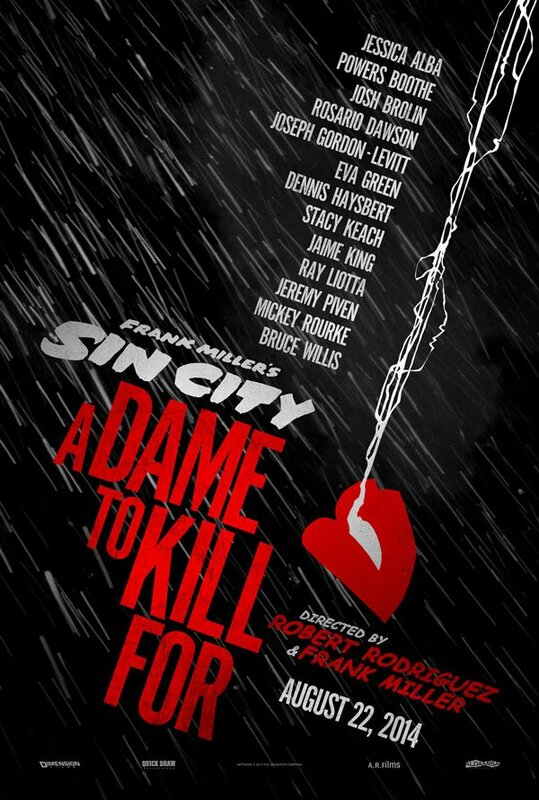 Lucky for you, Robert Rodriguez and Frank Miller are finally bringing forth Sin City: A Dame To Kill For. And with its release less than a year away ,its filmmakers have finally unveiled its first poster over at Yahoo. As you can see above, the film will feature the same dynamic use of high contrast black and white with isolated pop colors, plus boast a pretty spectacular line-up of stars, including Jessica Alba, Rosario Dawson, Josh Brolin, Joseph Gordon-Levitt, Eva Green, Bruce Willis, Jeremy Piven, and Ray Liotta. Based on Frank Miller's brilliant and bloody graphic novel series, Sin City first hit theaters in 2005, and the $40 million production pulled in an impressive $158 worldwide. This spurred The Weinstein Company and Rodriguez to discuss a sequel or two within weeks of the first film's opening. Considering the first film had plucked but a few threads from the tapestry of twisted crime stories Miller had penned for Basin City, there was lots of material to cherry pick for a second go. But then came a series of delays. For the titular dame, Rodriguez had his eye on the sultry Angelina Jolie. But those big lips depicted up on that poster aren't her signature smackers. Jolie's pregnancy initially stalled the production schedule. But while Rodriguez waited for a little Pitt-Jolie to be born, other problems brewed, like his sinking bankability. In 2007, Rodriguez and Quentin Tarantino teamed up to pay homage to the exploitation movies of their youth with the gritty, grimy double-feature Grindhouse. Despite a bunch of stars and seemingly guaranteed cool factor, this quirky experiment tanked hard. The $67 million dollar production made only $25 million worldwide, and hurt his relationship with TWC. By December of 2008, Miller was assuring fans the script was written, and maybe could be shooting by the spring of 2009. Meanwhile Sin City standout Mickey Rourke was sneering at the idea of returning to reprise his role as Marv (spoiler alert: he is.) Through 2009, Rodriguez tried to keep the flame alive, even when The Weinstein Company's rights to produce it expired. Rodriguez made headlines for the next two years with continued promises that Sin City 2 was happening soon. Finally by 2012, the wheels were in motion. Much of the original cast signed on, including Willis, Alba, Dawson, Rourke, and Jaime King. Eva Green (Dark Shadows) stepped into the shapely void Jolie left in the cast. Josh Brolin came on board to replace Clive Owen as a pre-plastic surgery Dwight, and Dennis Haysbert stepped in for the late Michael Clarke Duncan to play Manute. Production began in October of 2012, and a release date was set for October 3rd, 2013… until it was then it was reset for August 22nd, 2014. Even with all these delays, the movie, at long last, is done with production. Now Rodriguez just has to get it through the massive amounts of CGI and color correction demanded from the slick-looking comic book series. Here's hoping the release date on that poster sticks.